The idea of rescuing Mary Magdalene from her reputation as a prostitute, and instead portraying her as a sincere follower of Jesus Christ, is an interesting one. But the film Mary Magdalene, as genuine as its intentions may be, unfortunately fails to fully live up to this premise. 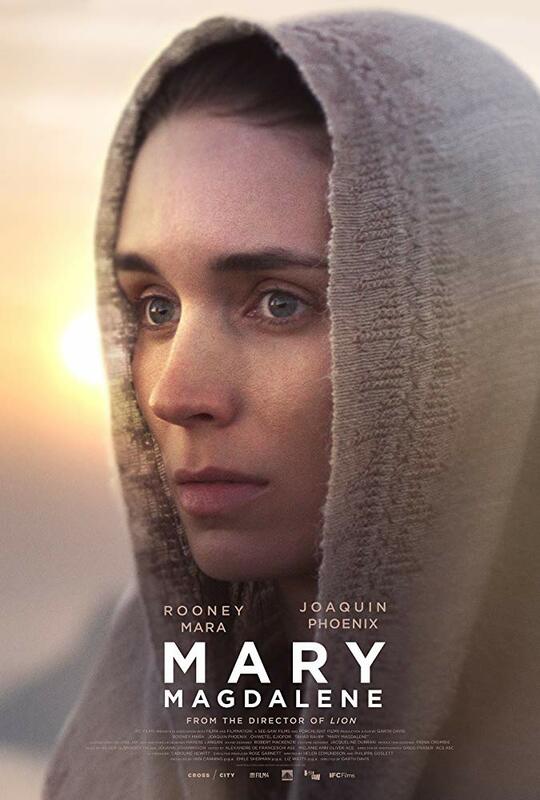 The film begins with Mary (Rooney Mara) as a young woman in Judea. She is betrothed to be married, but doesn’t want the typical life that is expected for women at the time, so she decides instead to go against the wishes of her family and start following Jesus of Nazareth (Joaquin Phoenix), a radical rabbi and prophet who is preaching about peace and ending oppression. Mary joins him and his group of male apostles, including Peter (Chiwetel Ejiofor) and Judas Iscariot (Tahar Rahim), on their long journey towards Jerusalem where Jesus will fulfill his destiny, and the film mainly focuses on the bond that forms between Mary and Jesus in the last few weeks of his life, leading up to the crucifixion and resurrection. Directed by Garth Davis, following up his awards season drama Lion, Mary Magdalene is more subdued and introspective than the majority of faith-based films. While it’s easy to admire the filmmaker’s choice to take a more artistic approach to exploring the lives of these two Biblical figures, the film lacks any sort of dramatic tension or sense of momentum, and it instead just sort of limply moves forward from scene to scene. The film also fails to do something revolutionary with the source material, like Martin Scorsese did in his controversial masterpiece The Last Temptation of Christ. The characterizations lack depth, and the well-meaning but overly sparse script by Helen Edmundson and Philippa Goslett struggles to portray the two central figures in an interesting or unique way. This unfortunately leaves Mara and Phoenix, a pair of great actors who in theory are ideal for these roles, seeming lost within the material and unable to breathe much needed life into the film. Mara’s wistful and overly quiet performance makes her character feel far too blank, and it’s far from the empowered reimagining of Mary Magdalene that the screenwriters clearly intended. Phoenix is a fascinating casting choice, but his portrayal of the Son of God simply isn’t as compelling as it could or should have been. To go back to Scorsese’s Last Temptation of Christ for a moment, think about the level of pain and suffering and humanity that Willem Dafoe was able to bring to his portrayal of Jesus in that film. Phoenix unfortunately isn’t given the opportunity to do the same thing here, which is one of the greatest shames of this overall surprisingly dull film. Mary Magdalene is now playing in limited release at Cineplex Cinemas Yonge-Dundas in Toronto and in other cities across Canada, as part of a special one week engagement.